Having halted my LEJOG walk at Hay on Wye and having had time to reflect on the numerous problems that beset me along the way, I thought I would do a breakdown of the trip including thoughts on the pieces of kit that I thought performed really well and those that didn´t. My reasons for calling a halt to the walk weren´t because of any physical problem, all of the problems I suffered in the early part of the walk had been resolved by the time I reached Hay-on-Wye. As I said in a previous post, during a phone call, my wife had expressed concern over the amount of time the walk was going to take when taking into account all of the delays and this combined with my concerns over her health meant I wanted to be present at some doctors appointments she had coming up. Also, because of the amount of days I had been forced to take off, the funds I had for the walk had diminished substantially, even though I was still only in South Wales. Overall, discounting the non-walking days, I was quite pleased with the distance I covered, which averaged around 19 miles a day. I hope to be able to return in the spring or early summer of 2019 to continue the walk. La Sportiva Ultra Raptors - Amazingly, these were my biggest problem in the early part of the walk. I say this because I have walked hundreds of miles in the same shoe/sock combination in the past with zero problems. In the first few days, I developed a large blister on the ball of my left foot, which burst causing me quite a lot of discomfort. I also developed a blister on the toe next to my big toe and various other hotspots all on my left foot. The other problem was a painful and swollen big toe, also on my left foot, which eventually became infected. Despite having walked not only in the same brand but in the same pair of shoes in the past, my left foot felt too big for the shoe. I can only put this down to the fact that the Raptors are quite a close fit and with the very hot and humid weather in the UK at the time, can only assume that my feet swelled in the heat. Decathlon Forclaz 500 shirt - I have to say that generally, I love Decathlon´s clothing and indeed, most of my hiking clothing comes from the store but this shirt was a mistake. It was sold as an item to be worn during long treks but I should have been alerted to the fact that the composition of the fabric was 70% cotton & 30% polyester. At times, my back was drenched in sweat and after two or three days, large light ´streaks´ had developed in the dark blue fabric where my rucksack straps sat. I binned it after about four days. I should have known better than to use a piece of gear that I hadn't previously worn on a walk. Mountain Warehouse Active Trainer Socks - I bought these as I thought lighter, thinner socks would help with the foot problems I was having by cooling them down and giving me more room in my shoes. They were very lightweight with a mesh top and because I purchased another item, I got both pairs for half price. I didn´t expect too much from them but I must say I expected them to last more than the few days that one pair did. Whilst pulling them up, my thumb went straight through the back of the sock. Geertop Pyramid Peak 1 man tent - I totally loved this. I had limited experience of using this tent before setting off but this is now firmly my first choice tent. Having recently been using my Trekkertent Stealth 1 on walks, I decided I wanted more space and two entrances into the tent. I also wanted a side entrance tent as the Stealth is front entrance, which I found difficult, particularly when getting out of it as you sleep with your back to the door. The Geertop was superb however. The luxury of having two doors and vestibules was a revelation as I could put my rucksack and wet gear in one and use the other for getting in and out and stowing my food and cooking gear. The tent uses trekking poles and I found the 'A' frame set-up very solid and although I never experienced any really wild weather, it stood up well to heavy rain and some blustery winds. The only negatives I found were the tiny zipper pulls, which I resolved with the addition of some ties. I also found that the two large ventilation panels at either end need setting up with care to avoid letting rain in. Otherwise, I can see this being my go-to tent for some time to come. Mountain Warehouse Rash Vest - I bought this as a replacement after binning my Decathlon shirt. To be honest, I didn´t realise it was a 'rash vest' at the time, I just liked the feel of the material. It proved to be a great shirt and never got noticeably damp, even in the very hot conditions. I also liked the fact that even after walking in it for a couple of hot days, it still remained largely free from odours. Samsung Galaxy Tab A 7" - Performed superbly in conjunction with Viewranger, which I had loaded with OS Landranger maps. Decathlon Kalenji Trail Rain Jacket - Kalenji is the Decathlon brand name of their running gear and this lightweight rain jacket weighs in at just 250 grams and packs down really small. Although for the early part of the walk, I didn´t need it as the UK was in the middle of a heatwave, I loved the lightweight feel of this jacket when I did have to use it, which kept me dry in some torrential rain near Bristol. 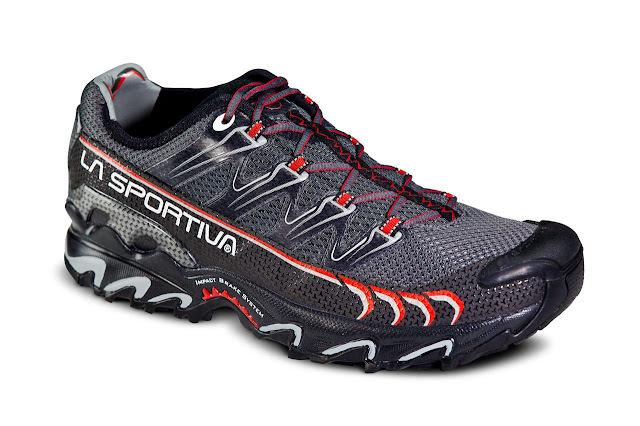 La Sportiva Ultra Raptors - Perversely, these feature in both the Success and Failures list! My wife delivered a brand new pair of these trail shoes to me in Devon in a half size bigger than the ones I had started off with and all of my foot problems vanished as I enjoyed hiking in them as I have over the past few years. Filtering water - Carelessness when filtering river water while wild camping was, I believe, the reason for my severe bout of sickness and diarrhoea in South Molton. While collecting and filtering water from the river at my wild camp on the Tarka Trail, which was surrounded by cattle fields, I stupidly re-inflated my dirty water bottle by putting it to my mouth a number of times. I´m convinced this is what caused my illness. Leaving the SWCP - Although easy in hindsight, my choice of route, which was to go inland and follow the Land´s End Trail, was a mistake. I had assumed that taking a more direct route inland would be shorter and easier but the opposite proved to be the case. Invisible and absurdly overgrown paths, poor or no waymarking etc. made this ´trail' an annoying, time consuming irritation. At one point, while following the exact route using GPS on the slopes of Brown Willy on Bodmin, the so-called LET led me through waist high ferns strewn with granite boulders with absolutely no sign of a path. I arrived at the summit hot and very irritated after a tiring ´bushwack´ through the overgrown hillside. 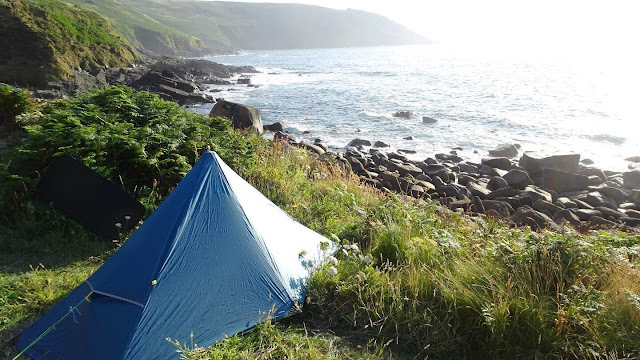 Were I to start LEJOG again, I would stick with the magnificent SWCP, even though the early section from Lands End to St. Ives proved to be tough walking. As suggested above, the SWCP was simply majestic. I really regret not sticking with this all of the way to Minehead. The Black Mountains section of the Brecon Beacons was also superb, with really scenic and remote feeling mountain country. Other highlights included the Wye Valley Walk from Chepstow to Monmouth, the Bodmin section (in spite of the LET) from Delford Bridge to Jamaica Inn over Brown Willy, highest point in Cornwall and the Mendips, including Cheddar Gorge and Beacon Batch, the highest point of the range. Without doubt, the Lands End Trail. Non-existent paths, paths that petered out to nothing, paths so overgrown that even trying to smash my way through with trekking poles at one point, I was still forced to turn back. I never saw one signpost for the trail at any point and returned to the SWCP and later resorted to walking country lanes. I would be interested to know if the creators of this ´trail' have walked it recently because it had the feel of a concept, rather than a trail that people actually walk. 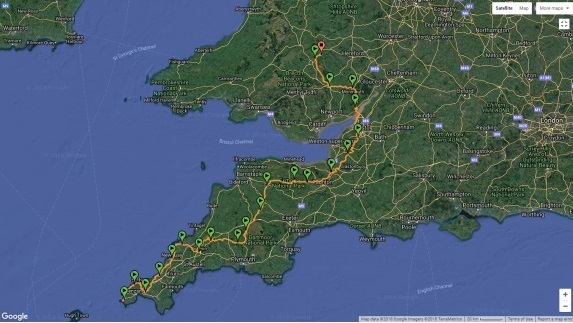 Perhaps it is just the Cornwall section that is neglected but I wouldn´t know because I had long abandoned trying to follow it before I reached Devon. Three times I turned up at locations where campsites were marked on my OS maps only to find that none existed. On two of these occasions, I was forced to locate wild campsites, which was annoying when expecting to have the facilities of a campsite. Many campsite prices were by far the highest I have ever paid with the clear winner being the Woodovis Campsite near Chipshop, outside Tavistock where I was charged 27 pounds for a small one man tent. To be fair, the campsite was quite luxurious but I just wanted a patch of grass and a shower but they don´t provide this so I ended up with a full size camping space with an electricity supply that I couldn´t connect to. The following night at a lovely campsite in Lydford, I was charged just 7 pounds. I can only assume the high prices reflected the fact that it was holiday season in the West Country but I still felt as if I was being ripped off. When planning a long walk, there is always the chance that things won´t happen the way you expect. However, on this walk, it was almost becoming laughable the amount of incidents that occurred. Ignoring the problems with the LET, I suffered blisters, something I haven´t had in years, an infected big toe, which held me up for three days in Launceston while I attended hospital. I then had a violent bout of sickness and diarrhoea that held me up for two days in South Molton. This, as I said above, I believe was caused by my carelessness when filtering water. After dropping my glasses onto a carpeted floor and both arms breaking off caused another delay of four days, I was close to calling a halt to the walk at this point but carried on for another week or so. While this was happening, back home, my wife had a faulty tap flood the bathroom and the car engine 'blew up'. More importantly, I was concerned with some health issues she had and wanted to be present when she attended appointments and this, combined with everything else and the rising cost of the trip convinced me that it was just not meant to be this time.